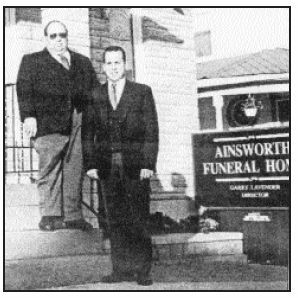 The Ainsworth Funeral Home in Wellington is nearing 100 years in operation. It has been in the same family for five generations. It is one of the few examples of a business in Prince Edward County that began nearly 100 years ago and is still owned by the same family. The business has been of central importance to the Wellington and area community. The family has also played a prominent role in the social and cultural life of that community. Tod Lavender, who is the current family member to operate the business, wants to see it continue to play that central and supportive role to the community as the enterprise moves into its next hundred years.